Human societies could not function without a reference system for recording when things happened or may happen. All societies invent calendars and remember their histories. Animals do not make calendars or writes histories. Solomon wrote that God placed long-term thinking (olam) in our mind (heart), which prevents us from understanding God’s works from beginning to end (Ecclesiastes 3:11). The heavenly bodies exist and provide markers for our activities and calendars. However, time has no actuality. In a similar manner, numbers exist in our minds as symbols for counting things. The counted things exist as do the cycles of the heavenly bodies, but time and numbers are only symbols that exist in our minds. Most western people imagine that time actually exists. This idea seems to have originated with early Greeks and was advanced by Alexandrian philosophers. Philo and Clement of Alexandria claimed God created time. Plotinus imagined a demigod who is changeless and sees all of time. Augustine was a disciple of Plotinus before his conversion. He imagined the biblical God with Plotinus’ concept of time. Augustine’s ideas about God and time influenced Catholic, Islamic, Jewish and Protestant theologians. He claimed that the beginning was not just the first stage of creation, but of time. He imagined that God sees the determined future. Nowhere does the Bible state that God created time or that He sees the future. It does say He actively brings about his plans for the future. By faith we are apprehending that the eons were passively equipped by the word of God out of things unseen (Hebrews 11:3). The passive verb suggests that He did not create time. The eons formed passively at God’s command. We can compare the shapes of the most-distant galaxies with local ones. We see that the galaxies were formed from unformed matter in the core, things that are not seen. We observe blue star globs, like beads on a necklace, emerging and spreading out from the red cores of many ancient galaxies. Scientists claim gravity causes the heavenly motions. Newton thought gravity is a force that perpetually emanates from unchanging matter. Einstein imagined a perpetually emanating field that warps the vacuum of space around unchanging matter. Visible cosmic history shows billions of star-streams accelerating outwards as countless galaxies grew into huge, local, growth spirals. The orbits are visibly going in the opposite direction from Newton and Einstein’s theories. How could He passively equip eons while the Earth only orbited the Sun about 6,000 times? Half way through the creation week, Elohim continued to form the Sun, Moon and stars and continued to place them in the spreading place (raqiya). Spreading orbits are accelerating orbits. Over the centuries, astronomers have measured a decreasing solar parallax as though the solar system is expanding. Although He finished multiplying the heavenly bodies by the sixth day, He continues to finish (imperfect verbs) the heavens and Earth (Genesis 2:1-2). He continues to call the stars to come out in unbroken continuity and none go missing (Isaiah 40:26). He continues to actively create the heavens in unbroken continuity, Isaiah 42:5. He continues in unbroken continuity to spread out the heavens and the earth. A global expansion seam forms new seafloor continually. The continents only fit together on a tiny globe. What we observe in galactic history is: (1) We observe how the light clocks accelerate along with the outward accelerating star streams in countless galaxies at many ranges. Even within one galaxy, we observe color changes between the core and the emerging arms. (2) The correlation between the visible changes in matter and the outward accelerating star streams suggests that gravity (which is invisible) emerges from the way matter changes as it ages. Evidently gravity was not as powerful when enormous pterosaurs and massive dinosaurs wandered the tiny little Earth, before the oceans spread out as the planet grew. If they were alive today, giant dinosaurs would be too heavy to run. (3) The delay in the propagation of the Sun’s gravitational effects is known as gravity aberration. (4) Gravity aberration produces a greater pull on the leading hemisphere. This unbalance accelerates days and years (rotations and orbits). (5) Gravity aberration also causes the planets to spread out into a logarithmic pattern, as we find in our solar system and in planets that orbit nearby stars. He once for all prepared the eons (which we confirm with eyesight). We confirm that the galaxies emerged from unseen matter. Evidently it is the gravitational phenomena that accelerates days and years so that the days and years of the son are shorter and worse than the days and years of the fathers (Genesis 47:9). Job, who may have lived less than 5,000 years ago – during the dinosaur age – mentioned how the Mediterranean dried during the few days of his life. 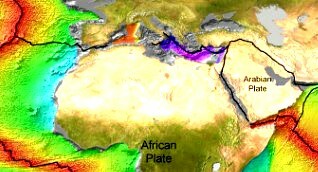 Indeed, drill cores show that the Mediterranean dried repeatedly. The map of the relative ages of the seafloor shows the spreading volcanic seam as a black line and the purple is the oldest seafloor and red is the youngest. Job claimed their faces deformed before they died (Job 14). If we lived for geological ages in few days, we would grow Neanderthal brows from vast age, just like we find in the fossil record. He did not create time. He passively prepared the eons from things unseen. The picture of logarithmic planet spacing is adapted from the work of wikipedia user Tdadamemd and is under a Creative Commons Attribution-Share Alike 3.0 Unported license. Gravity aberration pushes the outer planets outwards more than the inner planets. This is because gravity’s angular offset is larger (more aberration) for the more distant planets. This causes the solar system to expand as the sequential distance to the planets becomes logarithmic. Why don’t we freeze as out orbit expands. Because matter is changing causing the Sun to shine with white light today while 3,000 years ago the Sun was red and our sky was tan.